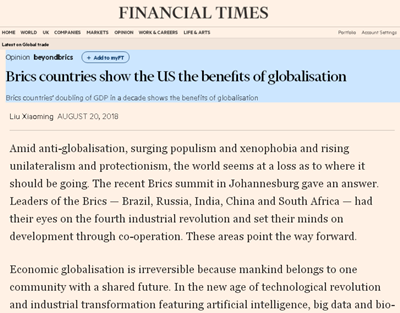 The Financial Times Publishes A Signed Article by Ambassador Liu Xiaoming Entitled "Brics countries show the world and the US the benefits of globalisation"
Amid anti-globalisation, surging populism and xenophobia and rising unilateralism and protectionism, the world seems at a loss as to where it should be going. The recent Brics summit in Johannesburg gave an answer. Leaders of the Brics — Brazil, Russia, India, China and South Africa — had their eyes on the fourth industrial revolution and set their minds on development through co-operation. These areas point the way forward. Economic globalisation is irreversible because mankind belongs to one community with a shared future. In the new age of technological revolution and industrial transformation featuring artificial intelligence, big data and bio-technology, every country is entitled to equal and fair development opportunities. International trade and competition are no longer a “zero-sum game” where one’s gain is another’s loss. Those — such as the US — who “put themselves before everyone else” will not only undermine their trading partners but also damage the multilateral trading system itself. Such an approach will most certainly backfire. In contrast, the Brics have been advancing economic globalisation in the past decade in the spirit of openness, co-operation, mutual benefit and win-win results. In doing so, they contributed more than 50 per cent of the world’s economic growth in 2017. The five countries’ combined outbound investment, trade and GDP has risen from 7 per cent, 11 per cent and 12 per cent of the world’s total respectively in 2007 to 12 per cent, 16 per cent and 23 per cent in 2017. Inclusive globalisation delivers common development, while unbalanced development is a breeding ground for populism, extremism and xenophobia. One cannot make these problems disappear by blaming other countries and diverting public attention. Forcing others to take medicine in order to cure one’s own illness will end up hurting everyone. The current international order is not perfect. But as long as it is rules-based and aims to be equitable, it should not be dismantled and rebuilt all over again. This statement of Chinese President Xi Jinping rings true. The world must say “no” in the face of arm-twisting hegemonism, power politics and self-centred unilateralism. To solve the problems of today’s world, countries should follow the overarching trend of multilateralism, deliver equity and justice according to popular sentiment and find ultimate solutions through win-win co-operation. To borrow the words of Charles Dickens, today’s fourth industrial revolution could be described as the “best of times and the worst of times”. Standing at the crossroads between opening up and isolation, free trade and protectionism, multilateralism and unilateralism, it is important that the international community makes the right choice and join hands to bring about “the best of times”.